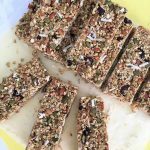 Make these homemade granola bars on the weekend for an easy make ahead breakfast option to keep you going throughout your busy work week. These bars are packed with protein, and super easy to make. They will give you the energy you need to keep you going all week long. You may also want to use these as an after work out snack for a quick refuel. These homemade granola bars are not only good for you, but they taste great too! And with ZERO unpronounceable ingredients, they are truly a win win win! I love protein bars and granola bars for an easy, quick snack. But with many of the options at the supermarket containing tons of processed ingredients, I’ve been buying them a lot less. Hence, my inspiration to make my own! I don’t know why it took me so long to make my own. They are truly EASY to prepare. Just toast your oats and nuts on a baking sheet. Then toss them together with all the remaining ingredients in a large bowl and mix well. Then press your mixture into a 9″x 9″ baking pan. Make sure to really press the mixture down firmly so they will hold when it’s time to cut them. I use the bottom of a measuring cup to help press down, but anything with a firm solid base will do the trick! Freeze the mixture for at least 30 minutes or longer. Then cut your granola into 10 bars or 20 squares, and enjoy! Store any leftovers in an airtight container in the freezer to maintain their shape and freshness. 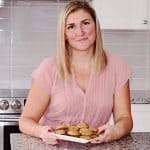 For more make ahead breakfast ideas, take a look at my Allergen Friendly Eggless Frittata Muffins, or this Easy Chia Pudding. For a delicious make ahead breakfast option, you just can't beat these sweet and salty, super yummy homemade granola bars. Preheat the oven to 350 degrees F and line a large baking tray with parchment paper. Slightly crush your almonds and walnuts. I put mine in a sandwich bag and smash them with a rolling pin. Do not over smash them, you want some chunkier pieces in your bars. Spread the oats, almonds and walnuts on your prepared tray and bake for 12 minutes, until lightly toasted and golden. Meanwhile, in a small bowl, add your peanut butter and maple syrup, and mix well using a fork until well combined. Set aside. In a large bowl, add all your dry ingredients including the toasted oats and nuts and toss to combine. Pour the peanut butter and maple syrup mixture over top and mix well. Line a 9"x9" baking pan with parchment paper and evenly distribute the granola mixture. Press down using your hands or a tool (I use the bottom of my measuring cup) to ensure there are no gaps, and help the bars hold together. Cover the tray with plastic wrap and place in the freezer for at least 1 hour before removing from the tray and slicing into 10 bars. Serve immediately and store any leftovers back in the freezer to help them hold their shape. Store your granola bars in an airtight container in the freezer to maintain freshness and hold their shape.